Jiangsu Dilong Heavy Machinery Co.,Ltd (Nanjing Dilong No-Dig Engineering Co.,LTD) is a member of iInternational Society forTrencless technology(ISTT) and China Society for Trenchless Technology(CSTT),started the application research of trenchless technology in 1996 and got registered in 1998.Jiangsu Dilong Heavy Machinery Co.,Ltd is the earliest specialized private company in trenchless technology development and construction in china. After long-term experiment and improvement ,our machine is qualified to go into the oversea market.Since 2002 we sold our machine througout the whole world.According to the development of the market and clients'demand,our designation and research team goes further and further.Till now we have several series of HDD machine:DL series machine and DF series machine ,of which DF series includes the most advanced mini HDD machine DFM1504,and the large HDD machine including 300T,450Tand more. 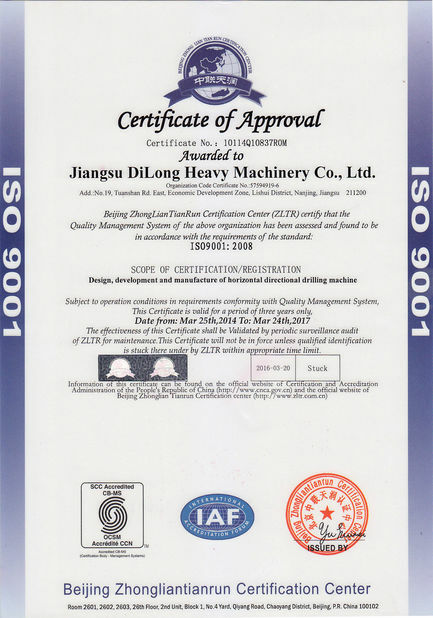 With the good performance and quality,also the best after sale sevice in china.Dilong HDD machine has sold to china and overseas,like Russia.Africa,india and so on. 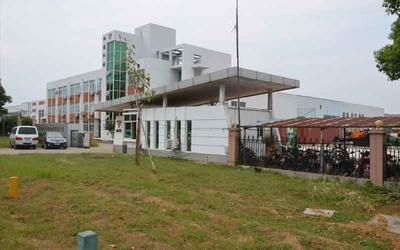 In order to provide timely and efficient service to our customers,our company set up one international branch in Russia and going to set up others in India and Nigeria.At present,the branch has worked well,covering tha main machine. Adhering to the enterprise spirit-being "professional and concentration",Jiangsu Dilong heavy machinery is making a bright furture with friends. Jiangsu Dilong Heavy Machinery Co.,Ltd (Nanjing Dilong No-Dig Engineering Co.,LTD) is a member of iInternational Society forTrencless technology(ISTT) and China Society for Trenchless Technology(CSTT),started the application research of trenchless technology in 1996 and got registered in 1998.Our company insists in business tenet of "creating excellent service by excellent technology"so as to serve all users sincerely. 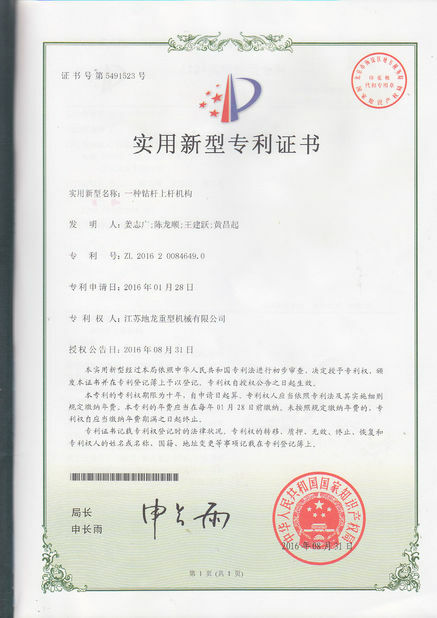 1:All the parts warranty period is from the date of the factory execution. 2:Supporing host diesel engine 、 mud pump and purchased parts in strict accordance with the manufacture execution . 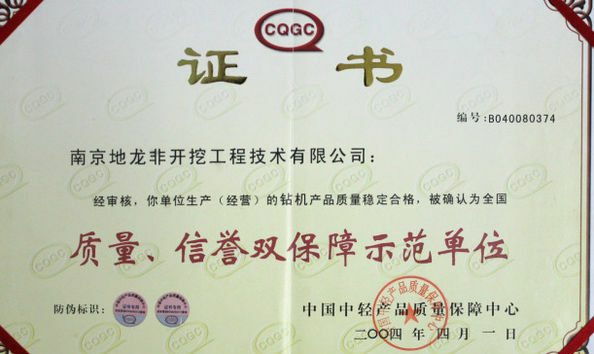 3:With the warranty period ,the non warranty parts loss,our company provide free technical services and guidance or installation,providing the supply of space parts. 4:Sales of parts warranty in accordance with half of the warranty period . 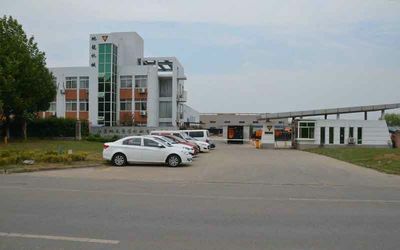 Our company mainly includes the production department, the sales department, the research and development center.Production sector is mainly factories, quality inspection, procurement. Sales department is mainly customer service and after-sales service.our company set up one international branch in Russia and Respectively, in Guangzhou and Tianjin set up branch offices.Covering domestic sales and aftermarket market. We adhere to sincerity,concentration, pragmatic spirit.